Program of Urubu River Upstream. All tours are done in the most flexible manner to suit the needs of our clients. Starting from 2 days, up to as many as you want. 07:00am, departure from your hotel in Manaus by (car, van or bus according to number of people), to a little village called Lindoia, about 2 and an half hours driving with a 10 minute stop halfway. 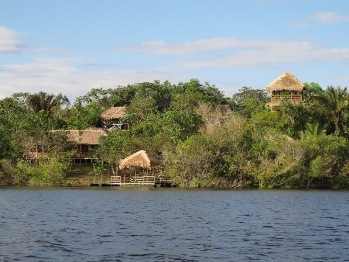 We travel from Lindoia village by speed boat upstream Urubu river for 45 minutes to our ecological lodge. On arrival the guide will show you about all the structure of the Lodge and provides your accommodation and it is possible to take a walk in one of the trail around the area. In the meantime the cook will prepare lunch. After having lunch you will have some time to relax and in the afternoon we go on a canoe trip paddling through the narrow channels and the flooded forest (during the high water season), going for fishing it can be piranhas but also other fishes of the region, in the end of the afternoon back to lodge to appreciate the Amazon sunset from the canopy watch tower. In the lodge the cook will prepare dinner with our freshly caught fish. After dinner enjoy a fantastic nocturnal canoeing and search for alligator (Cayman), in mean time listening to the night sound along the river channel. Departure early morning at 05:30 am by canoe for bird watching, searching for fresh water dolphin and appreciate a beautiful sunrise. Return to the lodge for breakfast. Starting the jungle walk accompanied by a knowledgeable native guide offering an exciting experience of which you will learn about medicinal plants and searching for animal, it will be a fantastic opportunity to know more about fauna and flora from the high land forest. Return to the lodge for lunch. In the afternoon starts an adventurous jungle walk where the guide will find a place for camping. At night it will be prepared an exotic dinner cooked on campfire together with the guide. During the night while relaxing in hammock there will be an amazing opportunity to hear how the sound of the forest changes along the night. This is a unique experience as you will be immersed in the true rainforest during the night and fall asleep with the sounds of the jungle. We wake early in the morning to have breakfast and afterwards do a walk continuing to search for animals in the area, learning survival skill of the jungle and extracting material from the forest without destroying it. Return to the lodge for lunch and relax. In the afternoon there is leisure time for swimming in the river. The guide will take you in canoe upstream the river to explore the lakes and enjoying the landscape (during the dry season, from September until February, it is possible to camp on beach and having a picnic on the bank of the lake while appreciating the stars from the hammock) or sleep in the lodge. If the river will be on low level season it will be a good time to do a spearing fish in the night. Breakfast and visit a native (Caboclo) family, to see how they live at the riverside and learn about the Manioc (cassava) process, with explanation from the guide. Back at the Lodge you will learn how to make some authentic Indian handicrafts using material collected from the jungle with the help from guide, you can even take home as a souvenir. After lunch we will start the journey back to Manaus. You will be back by (car, van or bus according to the number of people) at your hotel around 5.00 pm. All meals during the tour, accommodation at the lodge and hammocks for when camping in the jungle, all activities, native guide (English speaking), all transportation during the tour (boats/bus/car or van). The hotel provides filtered water or it is possible to buy mineral water in the bar at the lodge, as bottled mineral water is not included. Long-sleeved t-shirt or sweater, trousers, t-shirt, shorts, walking boots or trainers, raincoat, swim cloths, sun block, mosquito repellent, had/cap, pocket knife, flashlight, sleeping bag or blanket for when camping in the jungle, a bottle for water (filtered water is supplied at the loge), binocular if you have one.